As a huge fan of Shaun of the Dead I went into The World’s End with great anticipation. 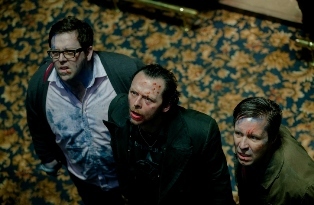 Though I was indifferent about Hot Fuzz, I still couldn’t help but be excited for the third film in Edgar Wright’s “Three Flavours Cornetto Trilogy.” I had hopes this film would capture the cleverness and originality of the first film. For the first half hour or so, I thought my expectations had a good chance of being realized. Instead all the promise displayed in the first act dissipates into an unfocused mess of sci-fi horror that has nothing to say. The greatest night of Gary King’s (Simon Pegg) life was when he and his four friends attempted to complete the “Golden Mile,” a marathon pub crawl, in 1990. Gary and his friends never made it to all 12 of Newton Haven’s pubs that night, but Gary relishes the joy he had in trying. Over 20 years later Gary’s life has gone nowhere. He is an alcoholic with no career and no significant relationships. Thinking he can recapture the hopefulness of his youth, he rounds up the same four friends (with whom he has had no contact in years) and persuades them to attempt the “Golden Mile” again, this time finishing it. Gary is the epitome of arrested development. He still wears the same Sisters of Mercy t-shirt under the long black trench coat he wore in high-school, his thinning hair dyed jet black. Unlike Gary, the friends have moved on. 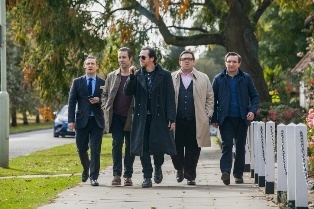 His best friend Andy (Nick Frost) is a workaholic lawyer, Oliver (Martin Freeman) is a successful high-end real estate agent, Steven (Paddy Considine) is a construction manager, and Peter (Eddie Marsan) sells cars. Why they agree to go with Gary is kind of a mystery. Maybe they also long for their forgotten youth, or maybe they just feel sorry for their loser friend Gary. One thing is certain, they are no longer friends. Their lives parted ways long ago. Anyone who has ever had an uncomfortable get together with an old friend can probably relate to that sudden realization that your lives don’t have anything to do with each other anymore. While the four wonder what they’re doing riding in “The Beast,” the same car Gary bought from Peter back in 1989, Gary is oblivious to the awkwardness. The scenes with the five friends attempting to reconnect are so funny and engaging it’s easy to forget that’s not what this movie is about, though maybe it should have been. The first 30 minutes have a lot to say. The film explores concepts about what comprises success and the realization that you are no longer a part of the youth generation. What is one’s role in the world when he has moved past youthful bravado and the intent to make an impact? It’s unfortunate the film didn’t stick with these themes. 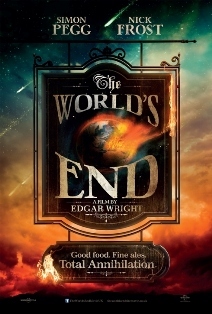 Instead the World’s End turns into something completely different. At the very moment Gary realizes he is not “The King” of Newton Haven, we are confronted with the realization that nearly everyone in the town has been replaced by robot-like aliens (nicknamed “Blanks”) that squirt blue liquid. It’s at that point the film also turns into a chase movie with no real point, or at least no point that hasn’t already been made in films like Invasion of the Body Snatchers. The problem is Gary never asks us to root for him. He is unlikeable and never really learns anything about himself – a point driven home by a ridiculous final coda. Unlike Shaun in Shaun of the Dead, Gary never aspires to any higher purpose. All he wants to do is finish his pub crawl for his own personal victory. He never seems to realize how hollow and meaningless his quest is, even when Andy points it out. Are we supposed to think Gary is a free spirit and everyone who holds a job and has a family is a mindless drone? I’m not really sure what they were going for. At one point Gary defends all of humanity against the alien invaders that are trying to take over, but he never realizes there’s any more to life than getting wasted. He just wants the freedom to do it. 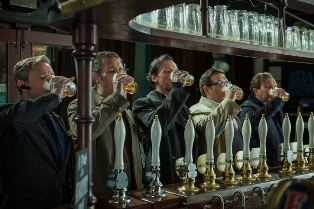 The World’s End is not a celebration of individualism, it seems to be more of a condemnation of progress. At least that’s what can be taken by the images of humanity being happier once technology has been wiped out. I could on about other little details, like how easily the “Blanks” are dismembered (making them less than formidable villains), or the fact that the movie stopped being funny about half way through, but I won’t. Instead I will sum it up in saying that The World’s End is a huge disappointment. No need to make any adjustments to my list of the best Simon Pegg performances as here he has lost his charm and likability.